The effect of shock waves (SW) on a mammalian cell line (PC-3) in vitro was investigated. Two types of cell damage induced by SW were observed; first, a significant increase of cell lysis occurred as the number of SW increased, and second, cell viability as determined by colony-formation ability decreased. Operating voltage had slight effect on cell lysis or colony-formation ability. When cells were exposed to SW at different distances from F2, greater cell damage was noted at positions closer to the spark plug along the blast path. 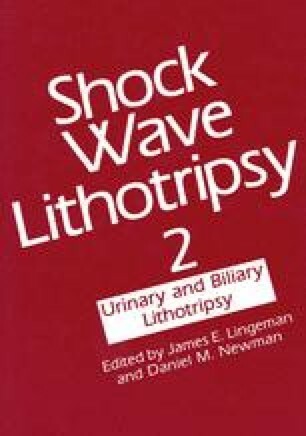 Therefore, the cell-killing effect of SW in vitro may reflect potential normal tissue damage to patients treated with shock wave lithotripsy for kidney stones.